For the following examples with the exception of the Java9 example, we’ll be using Maven to manage our dependencies. In addition the following POJO will be used in the following examples as a payload object that is used for publishing news. 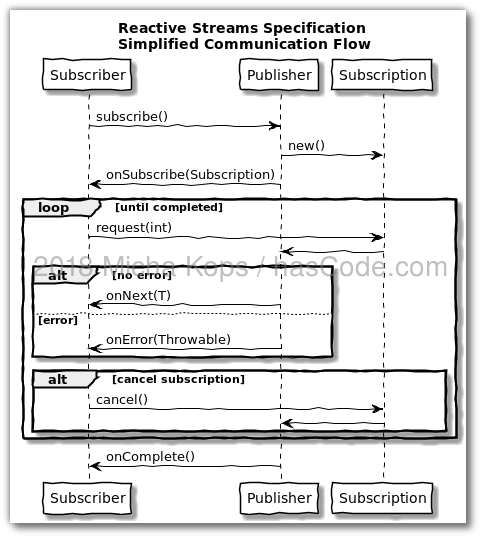 Our first examples uses the new Flow API in Java 9 that follows the Reactive Streams Specification and is aligned with the paradigms of the Reactive Manifesto: Responsive, Resilient, Elastic, Message Driven. For more details there is the Java 9 JavaDoc and an excellent blog article from Oracle: “Reactive Programming with JDK 9 Flow API“. no more news subscribers left, closing publisher..
RxJava is a a Java implementation of Reactive Extensions, RxJava2 also implements the Reactive Streams Specification mentioned above. For an example using RxJava1, please feel free to skip to this section in the appendix: “Appendix A: RxJava 1“. Akka offers its own implementation of reactive streams but additionally offers compatibility with the reactive streams contract e.g. using Producers and Subscribers. Reactor is another library for building non-blocking applications also implementing the Reactive Streams Specification. RxJava1 does not implement the Reactive Streams Specification but nevertheless here is an example similar to the ones above. To create diagrams in no time I’m using PlantUML. It’s like Markdown for diagrams and offers a super-easy ASCII-art like syntax. 2018-01-19: Typos in the PlantUML section fixed. 2018-01-15: Section about PlantUML diagramming added. 2018-01-15: Typo in Akka Maven dependencies fixed (thanks Jochen for mentioning). This entry was posted on Sunday, January 14th, 2018 at 9:21 pm	and is filed under Java. You can follow any responses to this entry through the RSS 2.0 feed. You can skip to the end and leave a response. Pinging is currently not allowed. I really love PlantUML for its simplicity and the feature to use a handwritten style. You can do even crazy things like reverting the colors (with skinparam monochrome reverse).